Listen to the full interview with Glenn Grishkoff. The paintbrush is nowhere near a new invention; it’s been used to create some of humanity’s most aged masterpieces. The modern example of the age-old technology is that of uniformity: neat rows of bristles perfectly shaped for any utility, often sprouting from colorful petroleum-based handles devoid of any character. 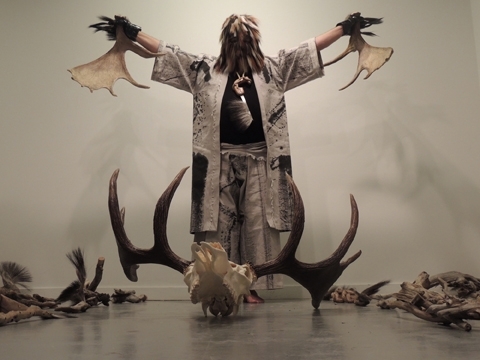 Glenn Grishkoff will give a live performance, creating a new work through his brushes and Allan Hancock College student collaboration, titled 'Moose Spirit' on Feb. 19 in the Ann Foxworthy Gallery. Glen Grishkoff, an accomplished sculptor and ceramicist whose work is currently on exhibition at Allan Hancock College, earned his M.F.A. in brush making. He began making his own brushes to paint his ceramics in the tradition of Japanese and Chinese calligraphy. Years’ worth of Grishkoff’s efforts are currently on view in Allan Hancock College’s Ann Foxworthy Gallery in the show A Brush with China: Family Markings. Grishkoff is a first generation American of Russian lineage, and the son of a father who was born in China, spoke Mandarin, and wrote calligraphy with sumi ink. The show display includes Grishkoff’s own sumi ink paintings made with the brushes he has created, one of his father’s own brushes, and his grandfather’s silk painting jacket. The brushes featured in A Brush with China are standalone art pieces in and of themselves, which can also be used to create other works, Grishkoff explained. 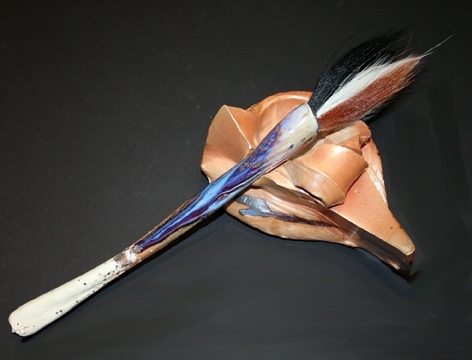 The significance of each brush is unique, as the materials Grishkoff uses are often found in nature. 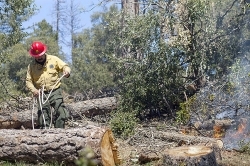 Whether combing the beach for the perfect piece of driftwood for a handle or receiving horsehair donated by the animals’ care taker, it’s this connection with nature that inspires Grishkoff to create a one-of-a-kind tool. A Brush with China: Family Markings features paintings, sculpture, and handmade paintbrush by Glenn Grishkoff showing through March 3 at Allan Hancock College. The artist will also feature some works that are a part of a larger art project he calls A Brush with Death, which includes brushes made out of the bones and fibers of dead animals found in nature or on roadsides. He also documents when and where he found the carcass and photographs them, hoping to make a traveling art show and a book out of more than a decade’s worth of exploring, collection, and creating. Grishkoff will spend a few days on Hancock’s campus, interacting with students and teaching in several art classes, including Ann Foxworthy Gallery director Marti Fast’s life drawing class. He will teach how to make artistic tools and will even welcome students to collaborate in a live art performance happening Feb. 19. Allan Hancock College presents the exhibit A Brush with China: Family Markings by Glenn Grishkoff showing through March 3. Grishkoff is creating a new work of art, live, on Feb. 19 at 11 a.m. in Allan Hancock College’s Ann Foxworthy Gallery, 800 S. College, Santa Maria. More info: 922-6966, hancockcollege.edu, or hancockcollege.edu. For the performance, Grishkoff will don a full body suite of brushes and painted canvas clothing, creating a new work on the spot. He will perform each brush stroke with the full movement of his body, concentrating his intention on uniting with the brush, “becoming the brush,” in the tradition of tai chi and Japanese calligraphy, he explained. Arts Editor Joe Payne is pondering the possibility of a beard brush. Contact him at jpayne@santamariasun.com.